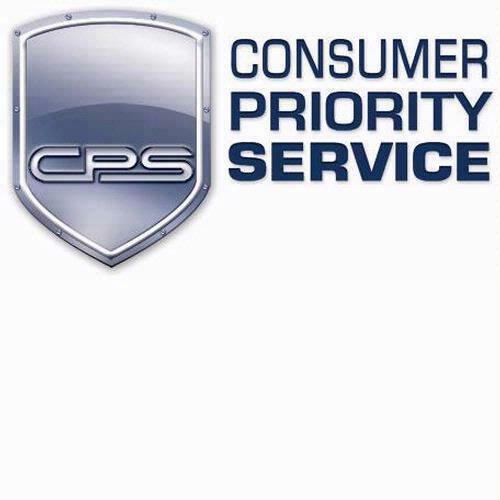 Consumer Priority Service™, Extended Service Plans, are all you need to protect your investment. This service plan offers the same high quality protection as your manufacturer warranty. CPS™ Extended Service Plans offer you the identical high quality protection as the manufacturer’s written warranty did. Our plans extend your coverage for up to 4 (four) full years after the manufacturer’s written warranty expires. We are not going to scare you by telling you that your product is destined to fail the day after the manufacturer warranty expires. However, we would certainly like to make it clear that part of the reason why manufacturers limit their parts and labor liability is because independent studies have often suggested that malfunction probability increases as your usage increases. So something you bought today has a greater chance of malfunctioning in 3 years from now than it does in say 2 weeks from now. A warranty card with terms of your plan will be shipped to you within 1 business day of placing your order. The following information contains the Terms & Conditions of this Contract. Obligors: The Company oblicated under this contract is Consumer Priority Service, Inc (“CPS”). To obtain service under this Contract, You must contact CPS during regular business hours at 1-800-905-0443 and obtain an Authorized Service Reference Number. A CPS Claims representative will provide you with detailed procedures regarding your claim. Please have your Membership ID number and your sales receipt available, as they will be required to obtain service. There is no deductivle required to obtain service for your product under this contract. If emergency service is necessary please describe the nature of the emergency to our customer service representative. Please note that during severe weather conditions and during peak seasons, we will give priority to emergency calls. Emergency service will be available at no additional charge during these times. Meaningful service will be initiated and completed as soon as reasonably possible. Foreighn language assistance may be available for your convenience. What is Covered: This Contract covers parts and labor costs resulting from a mechanical or electrical failure of the Product caused by defects in workmanship and/or materials, and may include costs of shipping the Product ot and from a repair center if required by CPS. As an extension of your written manufacturer’s warranty and unless otherwise noted, CPS service plans cover exactly the same parts and services offered in the manufacturer’s written warranty. If In-Home service is specified on the front of your membership ID card, service will be provided at the address identified in the registration of your Contract. In the event that your Product needs to be removed and repaired elsewhere, pickup and return related expenses shall be covered through your Contract. If you live outside of our coverage area (more than 60 miles from the nearest CPS service center), you may be required to transport or obtain transport for your Product prior to service. Carry In service – If In-Home service is not specified on the front of your membership ID card, your service level is “Carry In”. After a claim authorization request has been issued, You will be instructed how to proceed with your claim. You shall be required to bring or send your product to a Consumer Priority Service repair facility in order to initiate service on the covered Product. In the event that CPS opts to replace your Product, You may be required to ship your product to a designated CPS facility in order to initiate the replacent process. CPS will replace the covered Product with on of equal features or current market value or reimburse You for the replacement of the Product, at our discretion, when required, due to a breakdown experienced during normal wear and tear. Reimbursement may take the form of a gift card valid up to one year at a retailer who may carry similar products. Product breakdowns resulting from actions or events which would not be covered under the manufacturer’s written warranty will not be replaced. Term of Coverage: Coverage for Service Plans begins upon expiration of the manufacturer’s written warranty and extends for the duration indicated on the front side of the membership ID card. In the event of uneven length manufacturer coverage (e.g. 1 year part, 90 days labor), this Contract shall begin upon expiration of the maufacturer’s written warranty with the shorter duration. In the event a Product is being serviced by an Authorized CPS Service Center as the Contract expires, the term of the Contract will be extended until the covered repair has been completed. Limit of Liability: For any single claim, the limit of liability under this Contract to the Obligor shall be the lesser cost of (1) Repairs performed up to the purchase price originally paid for the covered Product as indicated on the sales invoice, (2) Replacement of your covered Product with a product of comparable functions or features, (3)Monetary reimbursement for authorized repairs or replacement up to the purchase price paid for the covered Product or (4) Monetary reimbursement or gift card up to the lesser of the price that You paid for the Product as indicated on the sales invoice or its current market value. In the event that the total of all authorized repairs exceeds the purchase price paid for the Product as indicated on the sales invoice or CPS replaces the Product with another product of comparable features or CPS reimburses you monetarily for repairs or the purchase price of the Product, CPS will have satisfied all obligations under this Contract and have no further liability. No Lemon Policy: During the term of this Contract, if after three (3) service repairs have been completed for the same defect on an Individual Product, and that individual Product requires a fourth repair for the same defect, as determined by Us, We will replace it with a product of comparable features or functions. Repairs performed while the Product is under manufacturer’s warranty do not apply to this policy. WHAT IS NOT COVERED. (1) INCIDENTAL OR CONSEQUENTIAL DAMAGES, INCLUDING BUT NOT LIMITED TO ANY DELAY IN RENDERING SERVICE UNDER THIS CONTRACT FOR LOSS OF DATA, OR FOR LOSS OF USE DURING THE PERID THAT THE PRODUCT IS AT A PREPAIR CENTER OR OTHERWISE AWAITING PARTS; (2) ANY AND ALL PRE-EXISTING CONDITIONS THAT OCCUR PRIOR TO THE EFFECTIVE DATE OF THIS CONTRACT; (3) DAMAGE FROM ACCEDENT, ABUSE, MISUSE, INTRODUCTION OF FOREIGN OBJECTS INTO THE PRODUCT, UNAUTHORIZED PRODUCT MODIFICATIONS OR ALTERATIONS; (4) FAILURE TO PROPERLY FOLLOW THE MANUFACTURER’S INSTRUCTIONS; (5) THIRD PARTY ACTIONS (FIRE, COLLISION, VANDALISM, THEFT, ETC. ); (6) THE ELEMENTS OR ACTS OF GOD; (7) WAR, INVASION OR ACT OF FOREIGN ENEMY, HOSTILITIES CIVIL WAR, REBELLION, RIOT, STRIKE, LABOR DISTURBANCE, LOCKOUT OR CIVIL COMMOTION; (8) DAMAGE CAUSED BY DEFECTIVE BATTERIES, POWER SURGES CAUSED BY DEFECTIVE BATTERIES OR REPLACEMENT OF DEFECTIVE BATTERIES; (9) WITH THE EXCEPTION OF DAMAGE MANIFESTING FROM POWER SURGES, DAMAGE COVERED BY ANY OTHER WARRANTY OR SERVICE CONTRACT; (10) PREVENTATIVE MAINTENANCE (11) DAMAGE WHICH IS NOT REPORTED WITHIN 30 DAYS AFTER EXPIRATION OF THIS CONTRACT; (12) COST OF INSTALLATION, REMOVAL OR REINSTALLATION OF THE PRODUCT; (13) PERIODIC CHECKUPS AND/OR MAINTENANCE AS DIRECTED BY THE MANUFACTURER; (14) ANY LOSS OTHER THAN A COVERED BREAK-DOWN OF THE PRODUCT; (15) PRODUCTS NOT ORIGINALLY COVERED BY THE MANUFACTURER’S WRITTEN WARRANTY; (16) NON-FUNCTIONAL OR AESTHETIC PARTS INCLUDING BUT NOT LIMITED TO PLASTIC PARTS OR KNOBS; (17) UNAUTHORIZED REPAIRS AND/OR PARTS; (18) PARTS FAILURE DUE TO A MANUFACTURER RECALL; (19) ACCESSORIES USED IN CONJUNCTION WITH A COVERED PRODUCT; (20) DAMAGE, WARPING OR RUSTING OF ANY KIND TO THE HOUSING, CASE OR FRAME OF THE PRODUCT OR ANY NON-OPERATING PART; (21) PARTS NORMALLY DESIGNATED TO BE REPLACED PERIODICALLY BY YOU OR CONSUMED DURING THE LIFE OF THE PRODUCT (I.E., BATTERIES, VIDEO CASSETTES, DVDS AND COMPACT DISCS, BULBS, ETC. ); (22) DAMAGE INCURRED DURING TRANSPORTATION; (23) LOSS OR DAMAGE RESULTING FROM THE FAILURE TO PROVIDE MANUFACTURER’S RECOMMENDED MAINTENANCE; (24) IMPROPER INSTALLATION OF COMPONENTS OR PERIPHERALS; (25) BURNED-IN PLASMA OR PHOSPHOR IN CATHODE RAY TUBES OR ANY OTHER TYPE OF DISPLAY; (26) ANY DAMAGE CAUSE BY A COMPUTER VIRUS; (27) ANY DAMAGE TO RECORDING MEDIA, INCLUDING ANY SOFTWARE PROGRAMS, DATA, OR CONFIGURATION/SETUP INFORMATION RESIDENT ON ANY MASS STORAGE DEVICES SUCH AS HARD DRIVES, CD-ROM DRIVES, DVD DRIVES , FLOPPY DISKETTES, TAPE DRIVES OR TAPE BACKUP SYSTEMS, AS A RESULT OF THE MALFUNCTIONING OR DAMAGE OF AN OPERATING OR NON OPERATING PART, OR AS A RESULT OF ANY REPAIRS OR REPLACEMENT UNDER THIS CONTRACT; (28) PRODUCTS WITH REMOVED, ALTERED OR INVALID SERIAL NUMBERS; (29) ALL COMPUTER SOFTWARE, INCLUDING CUSTOMIZED OR PROPRIETARY SOFTWARE, AND THOSE SOFTWARE ERRORS THAT CONFIRM IMPROPERLY FUNCTIONING OR DEFECTIVE SOFTWARE; (30) LOSS OR CORRUPTION OF DATA AND/OR THE RESTORATION OF SOFTWARE AND OPERATING SYSTEMS; (31) PRODUCT REPAIRS WHICH SHOULD BE COVERED BY A MANUFACTURER’S WARRANTY; AND (32) PRODUCTS SOLD “AS-IS” INCLUDING BUT NOT LIMITED TO FLOOR MODELS (UNLESS COVERED BY A FULL MANUFACTURER’S WARRANTY ON YOUR DATE OF PURCHASE0 AND DEMONSTRATION MODELS. Definitions: (1) We/Us/ Our: the company obligated under this Contract, as referenced the “Obligor” section of this Contract; (2) CPS: The administration of this contract; namely; In all states Consumer Priority Service, Inc. (3)Breakdown; The mechanical or electrical failure of the Product caused by defects in workmanship and /or materials; (4) Product The consumer item(s), which You purchased concurrently with and is covered by this Contract; (5) You/You The Individual who purchased the Product and this Contract, or the approved transferee. Transfer: This Contract is 100% transferable. To transfer your contract to a new owner, please send the $15.00 Transfer Fee along with your written request to the address specified at the end for these terms and conditions. Information provided by You must include the Contract membership ID number, date of transfer, new owner’s full name, complete street address and telephone contact number. CPS will proved You as well as the new owner with written confirmation of the transfer. Should you have questions or need assistance with a transfer please contact CPS at 1-800-905-0443. Renewal: This Contract may be renewable. Depending on the duration of the Contract and the Product which it covers, the Authorized CPS Deatler through which you have purchased this Contract may offer You a Contract Renewal plan to replace an expiring plan you have purchased through them. Renewals plans are bound by the same terms and conditions highlited herein. Durations of Renewal plans range from 12-36 months; beginning upon expiration date of your original CPS Contract and extending through the duration indicated on the front side of your new Membership ID card. Renewals may be done directly with CPS by contacting us at 1-800-905-0443. Registration: This Contract requires registration to be completed by You within thirty (30) calendar days of the date located on the original sales invoice of the covered Product. Failure to properly register within this time frame may void this Contract and result in denied coverage. Cancellation: You may cancel this Contract for any reason at any time by surrendering it to the Authorized CPS Dealer where You have purchased it. If you made your purchase through CPS Direct: You may provide written notice to Cancellations Department at the address listed below. In the event that You wish to cancel this Contract within thirty (30) days of receipt, You shall receive a full refund of the purchase price of the Contract. In the event You wish to cancel this Contract after thirty (30) days of receipt, You shall receive a pro rata refund equal to the purchase price less (1) an Administrative fee (not to exceed 10 percent of the price of this Contract or $25.00), (2) an Effective fee (pro rata fee based on the monts this Contract has been active), and (3) any claims that have been paid or repairs that have been made. CPS may not cancel this Contract except for fraud, material misrepresentation, non-payment, imporoper or failed registration, or if required to do so by any regulatory authority. If CPS cancels this Contract, You shall receive a refund of 100% of the pro rata unearned portion of the Contract price less any claims which have been paid. IN ALABAMA, HAWAII, MARYLAND, NEVADA, NEW YORK, TEXAS, WASHINGTON AND WYOMING: A ten percent (10%) penalty per month shall be applied to refunds not paid or credited within ninety (90) Days of receipt of a returned Service Contract. This is not a contract of insurance. Obligations of the Obligor under this Contract ar uninsured and backed solely by the full faith and credit of CPS In AL< CT, GA, HI, IL, KY, NC, NV, NY, SC, TX, UT, WA, WI, AND WY. If You have filed a claim in writing under this Contract and the Obligor fails to pay or provide service on a claim within 60 days of filing such a claim, or if You are otherwise dissatisfied please submit Your claim in writing and a copy of this Contract and the sales receipt for the Product to Attention: Service Contract Claims at the address listed below or call 1-800-905-0443 for assistance. Entire Contract: This Contract, including the membership card, terms, conditions, limitations, exceptions and exclusions, and the sales receipt for your exceptions and exclusions and the sales receipt for your Product constitutes the entire Contract. Your rights under this Contract may vary from state to state. Arbitration: To the extent permitted by applicable law, any controversy or claim arising out of or relating to the Contract, or breach thereof, will be settled by binding arbitration in accordance with the Commercial Arbitration Rules of the American Arbitration Association. A judgment upon the award rendered by the arbitrator(s) may be entered in any court having jurisdiction thereof. The parties specifically agree to the binding nature of the arbitration. ARIZONA ONLY: No claim incurred or paid will be deducted from the amount to be returned in the event of cancellation. In the “WHAT IS NOT COVERED” section of this Contract, exclusion 12) does not apply in the state of Arizona. CALIFORNIA ONLY: Informal dispute resolution is not available. CONNECTICUT ONLY: If You purchased this Contract in Connecticut, You may pursue arbitration to settle disputes between You and the provider of this Contract. The term of this Contract will be automatically extended for the period during which the Product is in the custody of a service center for repair. You may cancel this Contract if You return the Product or the Product is sold, lost, stolen, or destroyed. FLORIDA ONLY: The Arbitration section of this Contract is not applicable. In the event this Contract is cancelled by the Contract holder, return of the premium shall be based upon 90 percent of the unearned pro-rata premium less any claims that have been paid or less the cost of repairs made on behalf of the Contract holder, return of the premium shall be based upon 90 percent of the undearned pro-rata premium less any claims that have been paid or less the cost of repairs made on behalf of the Contract holder. In the event this Contract is cancelled by CPS, return of premium shall be based upon 100 percent of the unearned pro-rata premium. GEORGIA ONLY: If You cancel after thirty (30) days of receipt of Your Contract, You will receive a pro rata refund of the Contract price. In the event of cancellation by CPS, notice of such cancellation will be in writing and given at least 30 days prior to cancellation. Claims paid shall not be deducted from any refund owed as a relust of cancellation. CPS may not cancel this contract except for fraud, material misrepresentation, or non-payment by You. Any refund owed and not paid as required is subject ot a penalty equal to 25% of the refund owed and interest of 18% per year until paid: however, such penalty shall not exceed 50% of the amount of the refund. Under “What is Not Covered”, #2 is changed to “Any and all pre-existing conditions known by You that occur prior to the effective date of this Contract.” The Arbitration section of this Contract is not applicable. MICHIGAN ONLY: If performance under this Contract is interrupted because of a strike or work stoppage at Our place of business, the effective period of the Contract shall be extended for the period of the strike or work stoppage. NEVADA ONLY: No claim incurred or paid will be deducted from the amount to be returned in the event of cancellation CPS may not cancel this Contract without proving You with written notice at least 15 days, prior to the effective date of cancellation. Such notice shall include the effective date of cancellation and the reason for cancellation. NEW MEXICO ONLY: CPS may not cancel this Contract without providing You with written notice at least 15 days prior to the effective date of cancellation. Such notice shall include the effective date of cancellation and the reason for concellation. If this Contract has been effective for a period of seventy (70) days, CPS may not cancel before the expiration of the Contract term or one (1) year whichever occurs first, unless: 1)You fail to pay any amount due; 2) You are convicted of a crime which results in an increase in the service required under the Contract; 3) You engage in fraud or material misrepresentation in obtaining this Contract or 4) You commit any act, omission, or violation of any terms of this Contract after the effective date of this Contract which substantially and materially increase the service required under this Contract. A ten percent (10%) penalty per month shall be applied to refunds not paid or credited within sixty (60) days of receipt of a returned Service Contract. NORTH CAROLINA ONLY: You understand that the purchase of this Contract is not required to purchase or to obtain financing for the Product. CPS may not cancel this Contract except for nonpayment by You or for violation of any of the terms and Conditions of this Contract. OKLAHOMA ONLY: This Contract is not issued by the manufacturer or wholesale company marketing the Product covered by this Contract. This Contract will not be honored by such manufacturer or wholesale company. In the event You cancel this Contract, return of premium shall be based upon ninety percent (90%) of the unearned pro rata premium. In the event CPS cancels the Contract, return of premium shall be based upon one hundred percent (100%) of unearned pro rata premium. TEXAS ONLY: If You purchased this Contract in Texas, questions concerning the regulation of service contracts should be addressed to the Obligor of this Contract. UTAH ONLY: Coverage afforded under this Contract is not guaranteed by any organization other than the Obligor. Proof of loss should be furnished by You to the Administrator within 72 hours of the failure. Failure to furnish such notice or proof within the time required by this Contract does not invalidate or reduce a claim. We can cancel this Contract during the first sixty (60) days of the initial annual term by mailing to you a notice cancellation at least thirty (30) days prior to the effective date of cancellation. We can also cancel this Contract during such time period for nonpayment of premium by mailing You a notice of cancellation at least ten (10) days prior to the effective date of cancellation. After sixty (60) days have elapsed, We may cancel this Contract by mailing a cancellation notice to You at least ten (10) days prior to the cancellation date for nonpayment of premium and thirty (30) days prior to the cancellation date for any of the following reasons (a) material misrepresentation, (b) substantial change in the risk assumed, unless We should reasonably have foreseen the change or contemplated the risk when entering into the Contract, or (c) substantial breaches of contractual duties, conditions, or warranties. The notice of cancellation must be in writing to You at your last known address and contain all of the following: (1) the Contract number, (2) the date of notice, (3) the effective Date of the cancellation and, (4) a detailed explanation of the reason for cancellation. WASHINGTON ONLY: CPS may not cancel this Contract without providing You with written notice at least 21 days prior to the effective date of cancellation. Such notice shall include the effective date of cancellation and the reason for cancellation. WISCONSIN ONLY: Claims paid or the cost of repairs performed shall not be deducted from the amount to be refunded up cancellation of this Contract. You should furnish proof of loss to the Administrator as soon as reasonably possible. Failure to furnish such notice or proof within the time required by this Contract does not invalidate or reduce a claim Under “What is Not Covered”. WYOMING ONLY: In the state of Wyoming, arbitration can only be final and binding if agreed to by the parties involved, in a separate written agreement. Quality Assurance Consumers are always our first priority. If you feel that our service or the service offered to you through one of our Authorized Dealers is not excellent please write to our Customer Relations Department at the address indicated below. Please iterate what you feel we can do to rectify the matter for you.